Brian Kraft has been a constant, supportive figure in the effort to protect Bristol Bay from Pebble mine for many years now. Whenever news breaks, a planning meeting is held, or an update is given, you can bet Brian will be there, wanting to know the latest, how it'll impact his business and the region he loves, and asking how he can help. 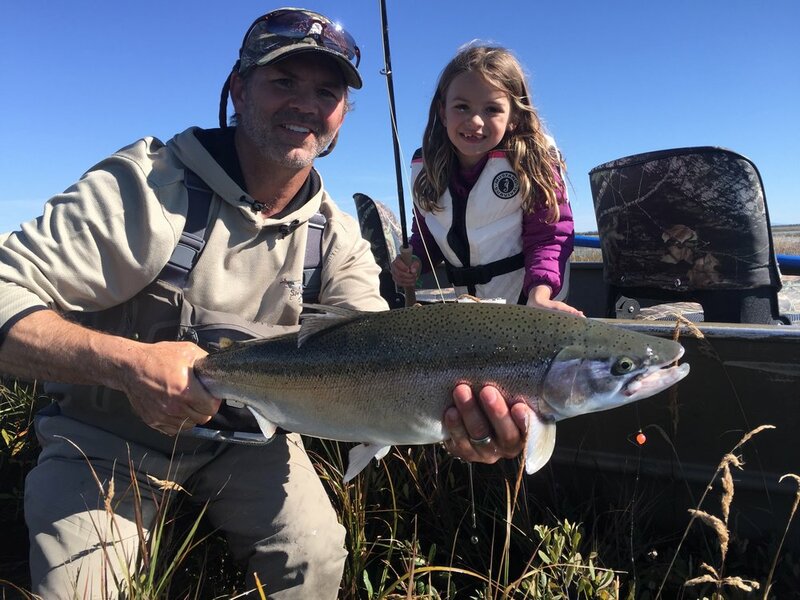 It has been an honor to partner with Brian to ensure Bristol Bay remains "salmon country" for this and many future generations of anglers to see and enjoy! Read more about Brian's history, his many contributions, and what inspires him to stay involved in the Question and Answer interview with him below. 3. Tell us a little about your business. We are remote fishing lodges in Southwest Alaska in an area known as the Bristol Bay. Alaska Sportsman’s Lodge sits on the Kvichak River, about 4 miles downstream from the mouth of Lake Iliamna. The Kvichak is known for the largest salmon run in the world, the sockeye run, and Alaska’s largest rainbow Trout. Bristol Bay Lodge sits on the edge of the Wood-Tikchik State Park and we fish waters on the western side of Bristol Bay. Both lodges offer home water fishing combined with fly outs to fish nearby rivers for the day. 4. Tell us a little bit about your background and initial connection to Bristol Bay. I started a raft rental float trip company in 1992 out of Anchorage called Kraft Adventures. This quickly grew and I was looking for rivers to take customers on for 5-7 day long float trips. I found some rivers in Bristol Bay and started guiding trips on them in 1993. I read about a lodge owner that got himself into a little bit of a bind with our federal government in May of 1994. I walked into the US Attorney’s office and asked if I could buy the lodge. They said no not yet, they had not convicted the guy yet. I said, well you better get someone in there to run it or everything that is not nailed down at that lodge is going to grow legs. So I cut a deal to operate that lodge for 2 years. I wanted to buy it, but the attorney representing this international drug runner stepped in and took the lodge from me for payment from his client. I was crushed. However, it was the best thing that ever happened. I found a partner, David Sandlin, who was a client at the lodge I was running in 1995. We found a piece of property and built Alaska Sportsman’s Lodge in 1997. 5. Favorite species of fish to catch in Bristol Bay & why? I enjoy catching all the salmon species. Seeing the massive run sizes is encouraging and inspiring to know that we still have a place left on earth that has a healthy intact habitat that is producing life. My passion is chasing big rainbows—thus the Kvichak. 6. Why did you decide to take action on Pebble mine? That’s a long story…how much time do you have? It was 2004 and the leader of the village by Alaska Sportsman’s Lodge, Dan Salmon, noticed a bunch of helicopter activity near Iliamna. He told me about the big mine that was supposed to go in. So I started looking into it. Sure enough, there was a large mine project being talked about. I knew nothing about winning at all. However, I had worked on Alaska’s North slope on the oil rigs so I was very familiar with oil extraction and how we do things up north. My initial reaction was, “Great, there will be jobs and this will be good.” However, I had some clients that were high up in mining companies that said, and I quote, “We try to do things right. The thing is our industry is consumptive. We must consume the habitat that is above the mineral deposit. We try to get things right but it doesn’t always work out the way we put it on paper in the plan.” They gave me some websites to research on. At the same time I had run into a couple of college professors that were in Environmental Engineering. One in particular was Scott Brennan. I quickly learned that mining on the size and scale and in the location where pebble is proposed —in sensitive habitat and right where at least three major salmon streams headwaters are at—that Pebble was the wrong mine in the wrong place. So I went and asked some national organizations for help. They were busy fighting bigger issues is the answer I got. So I started a 501c3 called the Bristol Bay Alliance. Scott and I went to all the villages in Bristol Bay and put on powerpoint presentations to the local residents. There were lots of images of what open pit mining was. It was a massive educational process. Alaskans are used to oil extraction, and thus mining and oil seem to get lumped together. However, they are vastly different. Mining consumes a massive amount of habitat and we needed to educate people about the situation. The Bristol Bay Alliance mission was: To ensure that the people that live, work, and recreate in Bristol Bay had the largest voice as to what happens to their lands.” In order to make that choice the people needed to know what was in Pandora’s Box. It became apparent very quickly that “we” the small group of us at the Bristol Bay Alliance, were going to need more help. Thus we reached out to Bob Gillam, a local Alaskan self-made Billionaire who cares about the region. We created the Renewable Resource Coalition which was an in your face, hard hitting advertising and government advocacy group that stored things up in our Capital. Also at the same time Trout Unlimited had reopened its Alaska office and Tim Bristol was in charge. He called me and asked if I wanted to help with TU’s efforts to battle Pebble. I did not hesitate and joined with Tim and the people of TU to go to war. 7. What do you wish others knew about Bristol Bay who have never experienced it? It is a vast, wild, set-sustaining ecosystem that has abundance of pure water, healthy fisheries, and wildlife that have been here for thousands of years. It would be nice if we left it the way we found it—or better. Photo courtesy of the Alaska Sportsman's Lodge facebook page. 8. When you think of the future of Bristol Bay, what gives you a sense of hope? What makes you concerned or worried? Hope comes through the fact that people are becoming more and more aware as technology makes the world smaller. The advancements in technology have actually allowed us to virtually show people what is at stake. However, as good as that is, it is not the same as being here—standing in a gin-clear river as thousands of salmon swim past you and brown bears chase them. The concern is that people have egos and greed. We as a species seem to think that we can “plan” something out and we can control nature—and when we screw it up, we can fix it. The sad truth is that we have messed up much of our wild fisheries and now must depend upon hatcheries and farms. I am concerned that people will think, “Oh, we can coexist—mining and fisheries—we will protect the fisheries and if we can’t we won’t do it.” I am afraid decision makers will actually believe that bullsh*t.
9. Anything else you want Save Bristol Bay and Trout Unlimited readers to know? The time to act is now. Do not wait. Every phone call and email to your congressperson and Senator is crucial. Your voice matters.